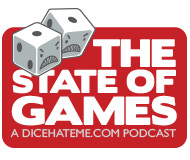 The State of Games, Episode 3 is live! A little disclaimer: for those of you put off by the simple word “Monopoly” in the title of this State of Games, stick with us, relax, and remember a time in your life when paying the rent could be as simple as finding some Free Parking. For those of you unfamiliar with the giant, sausage-grinding monstrosity that is Monopoly Live, feast your eyes on all its glory there on the right. You can also read more about it in the New York Times article mentioned in the podcast. In the picture, you can see the robotic monolith, the new tokens, the debit card slots, and the tax-evading taxi that slides around on a little monorail. Yeah, we don’t know what that’s about, either. One thing we do know is that the documentary mentioned in the podcast – “Under the Boardwalk: The Monopoly Story” – is excellent, and we both really enjoyed the story, the history and the quirky characters surrounding the Monopoly World Championships. To learn more about the documentary, head over to the official Under The Boardwalk website. Also, don’t forget to swing by the documentary’s Kickstarter page – there are only a few days left to become a backer and help the film reach more screens around the nation! Considering that I never really enjoyed Monopoly before, I’m not sure that this new version will do anything to change my feelings. I do give them credit for trying to push, what I think, is a pretty stale system into something that will be more accessible to younger players. There are just so many other games that we could bring to the table if we wanted to play with money or buy properties or even something as simple as rolling dice and moving. I can say that Monopoly Deal has been a big surprise to me! It was a great bridge for Lisa’s family, who are huge Monopoly fans, to some of the modern game that I am trying to introduce them to. I think I’m going to get Word on the Street today, btw. We’ll Skype it up soon! Great work on the podcast guys!! Monopoly Championship? Really? I have to see that documentary! I grew up playing classic Monopoly and it was kind of fun but the game lasted so long that we ended up gaving up. I haven’t play it again in years. So i’m not opposed to the new version, although I doubt that I will play it. But Monopoly Deal its a different story. The only similarity is the name and the properties. Me and my family really enjoy playing it and is one of our favorites. It more of a fun game and me not be suitable for serious gamers, but it can be finish in 10-15 min, and that is a plus. Congratulations on the 3rd episode. I have a problem at the end so didn’t get a chance to listen to the trivia. Will be coming back soon. Sally – email, Sally, email. I had to go all CIA on your reply. Ian – As broader gamers than most, we can instantly think of hundreds of other games we could introduce to younger players. However, for most of the public, Monopoly and the other old classics are all they’re being exposed to. Thankfully, games like Settlers and Ticket to Ride are sneaking into Targets and bookstores where today’s players can learn about that whole other world. In the meantime, I don’t blame Hasbro for doing what they need to do to keep an aging franchise viable. Of course, they also have to be careful not to tarnish the classics… remember New Coke? Monopoly Deal is such a great little gateway card game. And you know what’s interesting? I’m not sure it would have as much impact or emotional resonance if it wasn’t branded as Monopoly. You should definitely get Word on the Street, and we’ll throw down the gauntlet on Skype soon! Thanks for listening and for the kind words! Welip- It’s a great documentary, I think you will really like it. It’s funny, informative and sometimes nostalgic. I think that Monopoly Deal can be suitable for serious gamers, as long as they are in the right mind-set. It is a great family game and a wonderful filler. The box says you can play with more than 5 if you have multiple decks – I would love to get a huge game of this going sometime! Thanks for listening, and I hope you can come back and pick up the riddle later! Good luck! I’m one of those people that hates Monopoly. While it’s fun for the first thirty minutes as you buy up properties, I hate it after it calcifies and becomes a dice fest to see who goes bankrupt first. That said, I’ve never played with the official rules. I probably owe it a correct play before I mete out final judgment. I just know that I hate the house rules that everyone seems to play with. That said, I’m very interested in the documentary. I love learning more about gaming. I was never a big fan of Donkey Kong, but I thought King of Kong was awesome, hysterical, and insightful. GeekInsight – You totally need to play it with the full rules and no mercy. It really is a completely different game. The thing that makes Monopoly drag on forever is that you play with your family and then you have pity for them when they are bankrupt and want to keep them in the game, so you make sucker deals with them so they stick around. Eventually, they might come back and then you land on someone who has Boardwalk and pay a gajillion dollars in rent and then you realize you were a sucker back when they landed on Baltic while broke. Seriously – I’m not a huge proponent of Monopoly, but when played correctly and with iron-clad spirit, you can obliterate opponents in 90 minutes or less. As for the documentary, if you liked The King of Kong, you’ll totally love Under the Boardwalk. There are similar characters involved, but with much more history and nostalgia. Thanks for the great review of Word on the Street! We have a new word game coming out soon. Email me if you want a press copy! Leah – Thanks for the listen and the comment! Of course my wife and I would love a press copy of your newest. I’ll send you an email soon. I finally listened and am glad. Very interesting episode. 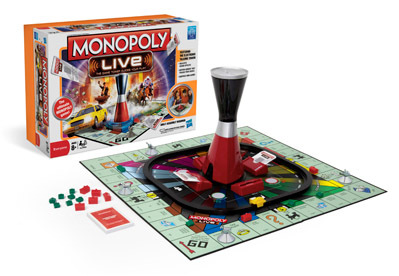 Monopoly Live – sounds like the Big Brother of games. I’m feeling like you did Dice. I would need to play it I guess. But don’t really have a desire to. I’d rather play the original. But as far as spin-offs, Monopoly Deal is quite good. My kids and I like it. Under The Boardwalk sounds like a fun, interesting movie. I need to go check it out. I also need to print out the real rules to Number 9. I’m sure I’m getting something wrong. And finally, like Monkey, I want to play Monopoly now. Mission accomplished. Your website is extremely wonderful … carry on the great effort!